When I first told my friends and family over a year ago that I would soon be moving to Hawaii, I was assailed by congratulations, as well as, orders to "enjoy the beach for them". Months later, as my flight approached the island of Oahu, I got my first glimpses of the world renowned\ beaches I'd been tasked with spending as much time as possible enjoying. From the air, the crystal-clear turquoise water was indeed a stunning view of my soon-to-be home. However, the resort and shopping mall dominated shores of Waikiki lining the dazzling ocean were a far cry from what I considered to be paradise. I began to have some doubts about how well a rural girl from the South, who isn't the best swimmer, would fair on a densely populated island thousands of miles away from her Appalachian home. After several frazzled days spent living in bustling hotels, overrun with the summer tourist crowd, I made the journey to the 'windward', or northern side, of the island to stay with a friend. That drive marked the start of a torrid love affair between myself and the magnificent Ko'olau mountains. On its way toward the northern shore, the H3 snakes its way deep into a valley, as if fleeing the glistening coast. The hills begin to grow into mountainsides covered in lush jungle until you suddenly find yourself venturing into an ominously long tunnel. Just when you’re starting to wonder what’s on the other side, you burst onto a stretch of highway perched high above Kaneohe Bay, flanked on either side by towering cliffs. As you proceed around a corner, you come titillatingly close to a ridge carved almost to a knifepoint by a thousand years’ rain. Creeping up this impossibly thin formation, like a skeletal metal millipede, the famed Haiku Staircase makes an unforgettable appearance. As I desperately tried to absorb these fantastic sights without crashing my car, an obsession began to grip my soul.............I MUST explore these mountains. So began my desperate search for the ancient paths and freshly blazed trails which would grant access to the island’s most hidden treasures. For a place that has SO many beautiful areas to hike, Hawaii's trails can be surprisingly hard to find. If you Google search "Hawaii hiking", or any iteration thereof, you'll turn up plenty of stunning pictures, personal accounts of individual hikes, and news clips highlighting the problems caused by dangerous & illegal trails. Every so often, after some digging, you can find some often vague and crudely written instructions for how to locate an unmarked trail. So, since I've already gone through the process of sorting out where the good information can be found, I'm going to tell YOU where to find it! Typically the first place I look for "official" information about hiking in a given area is with the National Park Service. Although there are several amazing national parks with plenty of hiking opportunities to be found on the Hawaiian islands, there are only two national historical monuments managed by the NPS on Oahu. Unfortunately, these do not qualify as "outdoor" adventures. So, no national parks to be found on the most frequently visited and highly populated island..... Discouraging but not the end of the world, right? Undeterred, I then moved on to my next step, State Parks. The Hawaii Division of State Parks lists 8 hiking trails located on almost as many state managed land areas. Less than two trails per park was a little disappointing to discover, but I decided not to pass judgment before I visited. However, after seeing the "trails" for myself, I started to lose hope of ever finding an established path into the gorgeous mountains I desperately wanted to explore. Truth be told, the trails listed on the State Park website are some of the MOST boring on the island. Don't get me wrong, they are worth doing if you're looking for an easy way to take in the views, but many don't qualify for what I would consider a REAL hike. In particular, the most popular ones are completely paved paths with no protection from the blistering sun and are swarming with people (I'm looking at you Diamond Head & Makapu'u Lighthouse). Definitely not the lonely trek up a wooded mountainside I was hoping for. As it turns out, the milk toast nature of these, most easily discovered, trails is by design. If you weren't already aware, hiking in Hawaii is notoriously dangerous. To compensate for the rugged & volatile terrain, the state has been forced to develop these popular tourist attractions, some would say to the point of making them mundane, in order to keep naive visitors from accidentally killing themselves. Although this resource is not likely to lead you on a any wild adventures, it is a good list of trails to start with if you are visiting or new to the island. This is precisely why I listed it first, even though as a resident, I rarely use it. These trails are mild by Hawaii’s standards, but many are still very steep and can be a rigorous workout. They offer a good introduction to island style trekking and reward you with simple access to some quintessential island vistas. After yet another set back, I decided I would just have to go investigate some spots which looked Iike they MAY be trail heads that I'd seen during my daily drive. The very first of these adventures did not turn out very well, and gave me a crash course on exactly why Hawaii's hiking game is so intense......BUT, that story is for another post. Suffice to say that I did eventually come across a trail sign indicating the trail was maintained by the Department of Land & Natural Resources. I was exasperated at this development, seeing as I felt that I had thoroughly searched the DLNR website and not found any mention of that particular trail. The DLNR portion of the sign was somewhat difficult to make out, since the sign was primarily dominated by the words "Na Ala Hele". Not familiar with the native Hawaiian phrase, I searched the internet. This time, I found exactly what I was looking for! 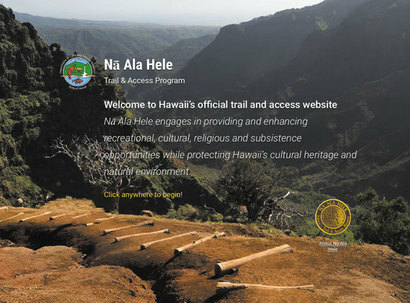 The Na Ala Hele website has the largest listing of official trails found on each of the islands, available in both list and map form. It also features important information, such as trail length & elevation change, that many other sources often lack. Alongside the essential information, most of the trail listings have detailed descriptions of the area’s ecology, as well as, specific hazards to be found along each route. ESSENTIAL to consider before attempting a hike from the list. These warnings are very accurate and are NOT exaggerated. If a trail is described as ‘Not regularly maintained’ or ‘Dangerous after rain’, you can expect to be bushwhacking along a barely visible path or under threat from flash flooding & landslides. MANY people are killed on Oahu every year while hiking. Falling from hidden cliff edges and being crushed in land/ rockslides are commonly the culprits of these fatal hiking accidents. If you have doubts about the conditions of a trail or your ability to cope with the cited hazards, PLEASE choose another trail! OR, you can jump on the Girls Who Hike Hawaii Chapter to ask questions & request a hiking buddy. The beauty of this resource is that it allows users to track & upload their own hikes to a database accessible to other users. It also allows you save your recorded hikes in your personal record, in case you don’t want to share. But, because these trails are posted by individuals, there are many ‘unofficial hikes’ listed. This can be good or bad, depending on how you look at it. On the one hand it is a good place to find many lesser-used trails. But, it also means that some of the information may be inaccurate or misleading. As with any information you receive from unofficial sources, use common sense and verify details through another source if possible. Another detail about hiking in Hawaii, that is different from much of the mainland, is that often you need to determine whether an ‘unofficial trail’ is an illegal trail. The AllTrails website has been pretty proactive about labeling their listed trails as “Closed” if there are any access issues related to it. As a general rule, if you see a ‘Private Property’ sign near the trailhead, you may need to do more research on how to legally proceed. But, just because a trail is not officially maintained by any group, doesn’t necessarily mean that you can’t use it! There are many perfectly legal trails located on publicly-owned land areas besides State Parks, particularly within the forest reserves. Both the Ewa and Pupukea-Paumalu Forest Reserves are covered in a complex spider web of trails, ripe for exploring. However, because the forest reserves are often much more isolated and maintained far less than State Parks, they are NOT good places to go adventuring alone. Whenever attempting an unofficial trail, I would HIGHLY suggest bringing a buddy, leaving a hiking plan with someone who is not accompanying you, and being familiar with the basics of land navigation. Most of the trails found on Oahu’s forest reserves are not clearly marked and can be very confusing. It is quite easy to get turned around when there are often hunting or boar trails criss-crossing the landscape with no particular destination in mind. This is where AllTrails map function comes in very handy. When planning a hike off the website, I would highly recommend downloading the map to your phone before heading out. Cell reception can be very unpredictable in the Hawaiian mountains, and getting stuck without access to your navigation could put you in serious pickle. After downloading the map of your desired trail, I would also recommend reading through the comments section. There is a rating system in place for each trail, but the difficulty level is set by the person who recorded the route. I have seen trails that were listed as easy when they definitely would NOT be considered such by most people. However, this discrepancy between perception & reality can usually be discovered within other frustrated users’ comments. I realize that some of you are probably rolling your eyes at the mention of such an antiquated resource as paper books, but please hear me out! Some of the most detailed, accurate, and comprehensive information on Hawaii’s trails can be found in hiking guidebooks. The BEST information I’ve found on the more remote hiking areas have been from older (I’m talking 10+ years old) guides that were published before hiking was as highly regulated as present. Now, I’m not suggesting you go purchase every ’Guide to Hiking Hawaii’ you come across. You’d go broke quickly and not be much the wiser. That, and the hidden value of less modern guides, brings me to the second half of my recommendation, the library! If you’re only visiting the islands, and therefore can’t check books out, don’t despair. Most libraries on the mainland have at least a couple books on Hawaii available. Also, just because you can’t take the books from the local library home with you doesn’t mean you can’t use them for research and make copies/ take pictures of useful excerpts. So, of the undoubtedly thousands of hiking guides for Hawaii, where should you start? Anything by Stuart Ball is going to contain very good information. Locally, he’s considered THE expert on hiking in Hawaii and his book “The Hiker’s Guide to Oahu” is a must read for anyone serious about exploring the island. The ‘Hawaii Revealed” series of guidebooks, produced by Wizard Publications, have lots of good over all information about the islands as well. They are not specifically focused on hiking, but their outdoor adventures sections can be very helpful to those not already familiar with the area. However, because the series is highly commercialized and frequently updated, the hiking specific information found in the OLDER texts often contains details that are purposely NOT advertised any longer. I’ve found these little secrets to be particularly helpful when attempting some of the island’s more obscure and rigorous trails. Unreal Hawaii is a self-proclaimed ‘digital magazine’ that can sometimes resemble a photo laden blog. The site is privately run by a group of outdoor enthusiasts that I, frankly, don’t know all that much about. Similar to many of the first-person accounts available on the web, the useful bits of information found here have to be inferred from somewhat vague descriptions of a trail. The reason I list the site as a resource is that they have some some handy information about many of the more ‘extreme’ hikes on the island. Most of their descriptions lack explicit directions and opt to use photos as guideposts for navigating the trails. I’m assuming that the reason for this is that several of the hikes depicted traverse private land or are explicitly illegal to attempt. I would encourage you to read their disclaimer found at the bottom of the webpage. That being said, if you are a VERY experienced outdoors person and familiar with the area, some of these hikes are worth attempting. The site breaks down the hikes into a handy list ranked by difficulty. Because the list was compiled by some avid hiking enthusiasts, they tend to rank on the low side. Most of the hikes in the intermediate category would be considered quite hard by most. Almost all of the hikes sited in the advanced category require some specialized skills, like rock climbing. The hikes rated as ‘extreme’ are far too dangerous to recommend to anyone but a bonafide professional. Extreme is NOT an understatement in this instance, many of these trails claim several lives per year. But, if you are a looking for an intense adventure far from the beaten path, and have a bit of a reckless streak, this site can help you prepare for what to expect on some of Hawaii’s more intense trails. Emily is currently one of our Ambassadors for Girls Who Hike Hawaii. You can join her local meetups and discussions through the Hawaii chapter by clicking here.